President Rodrigo Duterte catches the attention of the Russian newspapers after the Philippine President warns Obama to avoid asking him about human rights. 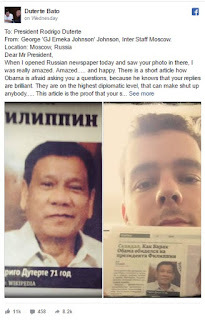 According to GJ Emeka Johnson a Russian Duterte supporter that currently living in Moscow, he was amazed and surprised that President Duterte is now famous in Russia after his controversial statement to US President Barack Obama. 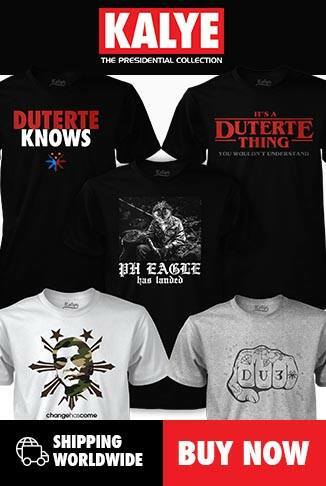 The short article says how Obama is afraid asking questions to President Duterte because he knows that he can make everybody speechless with his brilliant replies. According to GJ, the Russian Newspaper’s article is an evidence that President Duterte is already famous and recognized in Russia. The OFW that also working in Russia are happy to see Duterte catching the attention of the Russian Media.